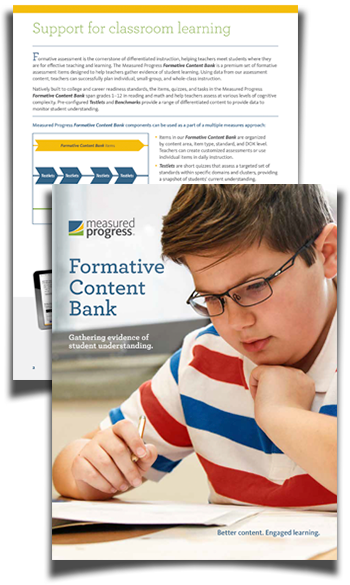 Designed to help educators gather dependable evidence of student learning, the Measured Progress Formative Content Bank is a set of premium formative assessment items and quizzes. Built to college and career readiness standards, the bank contains content for grades 1–12 in reading and math. This range of resources supports districts in creating high-quality common district assessments, teachers in assessing various levels of cognitive complexity, and students in reaching higher levels of rigor expected by statewide tests. Fill out the form to learn more about the Formative Content Bank.